Signaling pathway for antibodies in the PathScan® Multi-Target HCA DNA Damage Kit. Representative confocal immunofluorescent images display typical localization of the individual proteins in untreated (left) or treated (right) cells. Schematic representation of a potential 96-well plate layout for the PathScan® Multi-Target HCA DNA Damage Kit. 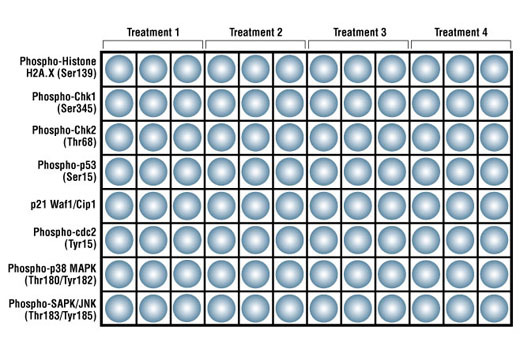 On this generic map, four treatments are performed in triplicate down the columns of the plate, while each of the eight antibodies is applied across individual rows of the 96-well plate. This layout is designed to allow the investigator to monitor the signaling of the DNA damage pathway on one 96-well plate. The diagram above is one example; users may wish to reorganize plate map according to their needs. 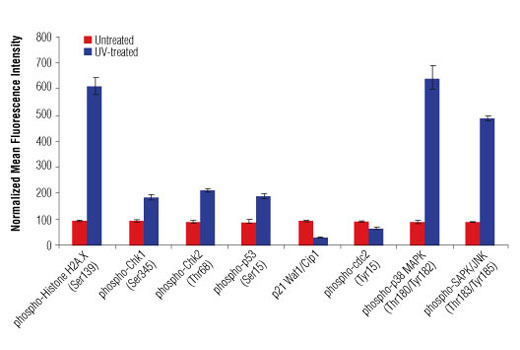 HepG2 cells were left untreated (blue) or subjected to a 100 mJ UV treatment followed by a 1 hr recovery period (red). Mean fluorescence intensity was measured for antibodies in the PathScan® Multi-Target HCA DNA Damage Kit. Data were generated on the Acumen® HCS platform. A549 cells were exposed to varying concentrations of caffeine for 30 min prior to and 1.5 hr following a 100 mJ UV-treatment. 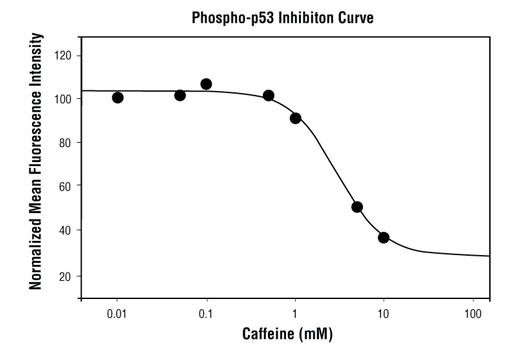 With increasing concentrations of caffeine, there was a significant decrease (~2.5-fold) in phospho-p53 as compared to the UV-treated control. When using phospho-p53 as a measurement, the IC50 of this compound was 2.95 mM. *Component formulation specific to kit. CST’s PathScan® Multi-Target HCA DNA Damage Kit contains eight primary antibodies that target the DNA damage cellular signaling pathway. 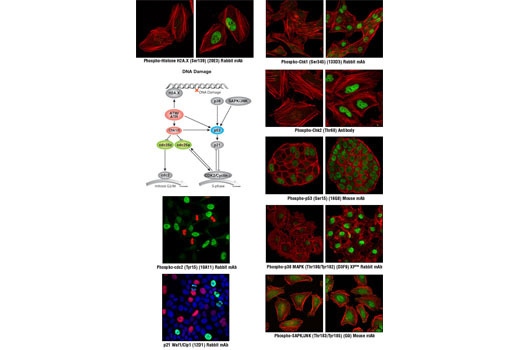 This kit is designed to elucidate the signaling occurring through key pathway nodes using automated imaging or laser scanning platforms or manual immunofluorescent microscopy. The kit provides the investigator with a quick and easy means to choose the endpoints that will be the most robust and useful for subsequent studies, whether large high content/high throughput screening projects or single small-scale experiments. The antibodies are supplied at 10X of their optimal dilution for immunofluorescent applications. This allows the antibodies to be easily diluted to their 1X working concentrations and dispensed into multi-well plates or slides. 140 μl of each antibody is supplied, which is sufficient for 24 wells on 96-well plates (50 μl 1X per well) or one row on two 96-well plates. Each activation state antibody in the PathScan® Multi-Target HCA DNA Damage Kit recognizes the indicated phosphorylated form of its target. p21 Waf1/Cip1 antibody recognizes total p21 protein, independent of its phosphorylation state. Monoclonal antibody is produced by immunizing animals with synthetic phosphopeptides corresponding to residues surrounding Ser15 of human p53, Thr180/Tyr182 of human p38 MAPK, Ser345 of human Chk1, Thr183/Tyr185 of human SAPK/JNK, Ser139 of human histone H2A.X, Tyr15 of human cdc2, or the carboxy terminus of human p21. Polyclonal antibodies are produced by immunizing animals with a synthetic phosphopeptide corresponding to residues surrounding Thr68 of human Chk2. Polyclonal antibodies are purified by protein A and peptide affinity chromatography. Cell cycle control involves an ordered series of cellular signaling events designed to maintain the integrity and proper function of cells and biological pathways. Cells have evolved complex mechanisms, collectively termed the DNA damage checkpoint, to modulate cell cycle progression in response to genomic insult. Damage to DNA caused by either internal or external sources such as UV light, ionizing radiation, genotoxic agents, etc. initiates a cascade of events that blocks cell cycle progression to either allow time to repair damaged DNA, or activate cell death pathways if too much damage has been incurred. Monitoring the signaling components of the DNA damage pathway is important to aid in understanding the aberrant cellular signaling associated with unchecked cell cycle control in disease states such as cancer. Cell cycle progression can be affected by the DNA damage checkpoint at the G1/S transition, during S phase, or at the G2/M phase transition. At G2/M, cdc2/cyclin B activity acts as a master regulator of entry into mitosis (1). The cdc25C phosphatase removes inhibitory phosphorylation on Thr14 and Tyr15 of cdc2, allowing for maximal activation of cdc2/cyclin B (1,2). When DNA damage occurs, a signaling cascade is activated that inhibits the ability of cdc25 to activate cdc2/cyclin B. A proximal event in the signaling pathway is localization of Ser139-phosphorylated histone H2A.X to sites of DNA damage at subnuclear foci (3). Histone H2A.X and other mediators recruit additional signaling molecules to the site of the damage, activating the ATM/ATR kinases, the central mediators of the DNA damage response. ATM is primarily activated by double strand breaks of DNA (4,5), while ATR is activated by a variety of DNA lesions and replication stresses (6). ATM/ATR in turn initiate two parallel cascades that inactivate the cdc2/cyclin B complex (7). The first cascade rapidly inhibits progression into mitosis through the activation of the Chk kinases (Chk1 for ATR and Chk2 for ATM), which phosphorylate and inactivate cdc25, preventing activation of cdc2/cyclin B (8-10). The more long-term second cascade involves phosphorylation of the tumor suppressor protein p53, leading to either cell cycle arrest and DNA repair or apoptosis through regulation of p53 downstream effectors, including the tumor suppressor protein p21 Waf1/Cip1 (11). Upon DNA damage, p53 is phosphorylated at a number of sites and up-regulates p21 transcription via a p53 responsive element. p21 expression can block cell cycle progression by inhibiting a subset of the cyclin-dependent kinases including cdc2 (12,13). In addition to canonical ATM/ATR checkpoint signaling, the SAPK/JNK and p38 MAP kinase pathways are activated by a variety of cellular stresses including inflammatory cytokines, UV light, and growth factors (14,15). These stress-activated pathways contribute to G2/M checkpoint control through activation of p53 and other MAPK substrates, such as MAPKAPK-2, which can directly affect components of the checkpoint cascade, such as cdc25 (8). Stark, G.R. and Taylor, W.R. (2006) Mol Biotechnol 32, 227-48. Hoffmann, I. et al. (1993) EMBO J 12, 53-63. Rogakou, E.P. et al. (1999) J Cell Biol 146, 905-16. Cliby, W.A. et al. (1998) EMBO J 17, 159-69. Blasina, A. et al. (1999) Curr. Biol. 9, 1-10. Furnari, B. et al. (1999) Mol. Biol. Cell 10, 833-845. Kobayashi, J. et al. (2009) Biochem Biophys Res Commun 380, 752-7. Stuart, S.A. and Wang, J.Y. (2009) J Biol Chem 284, 15061-70. Pearce, A.K. and Humphrey, T.C. (2001) Trends Cell Biol 11, 426-33. Johnson, G.L. and Lapadat, R. (2002) Science 298, 1911-2. Reinhardt, H.C. and Yaffe, M.B. (2009) Curr Opin Cell Biol 21, 245-55.